Terrazzo flooring has undergone a few major changes since it was used to pave the outdoor spaces of Italian stoneworkers’ homes hundreds of years ago. “Terrazzo” is the Italian word for terrace, and the workers developed the flooring idea by spreading out marble chips and embedding them in clay. From there, terrazzo evolved into a pourable mixture of cement and stone chips, polished to a glassy finish after hardening. The next big innovations came with the addition of synthetic resin binders (instead of cement) and a relatively DIY-friendly version of the flooring: terrazzo floor tiles. Real terrazzo floor tiles—that is, the stuff most like traditional poured-in-place terrazzo flooring—is made with chips of stone, glass or other material suspended in a binder or matrix. After grinding and polishing in the factory, it’s cut into uniform tiles, typically with a water-jet cutting machine. Most terrazzo floor tiles are made with an epoxy resin binder and range from 1/4-inch to 1/2-inch in thickness. You can also find thin, flexible terrazzo floor tile that’s more akin to vinyl or linoleum tile than poured cement. Like traditional versions of the flooring, terrazzo floor tiles are highly customizable. You choose the color of the matrix (background color) and the type and amount of chips added to the mix. Chip materials cover a huge palette of options, from marble and granite to onyx and mother-of-pearl to plastic and glass. Recycled glass is a popular choice these days. The colors and light effects of the glass chips can be stunning, and high percentages of post-consumer material help homeowners go green and builders score points toward green-building certification. 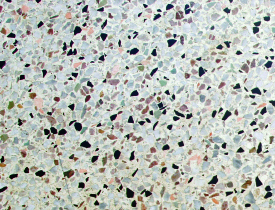 Most of the design appeal of terrazzo floor tile is in its unique confetti-like look, and tiles are typically installed to resemble poured-in-place terrazzo. As a result, floor tiles come in a limited range of sizes and shapes. Unless you can pay for custom shaping and sizes, you’re most likely limited to 12-inch square tiles. Some commercial products are sold in 3-foot-long planks and large, 2-foot or 4-foot square tiles. Installation varies by tile type and manufacturer. Standard tiles are installed with thin-set (cement based) adhesive and epoxy or acrylic grouts. Often, the grout joints are kept very small, or the tiles are actually butted together to create the illusion of a continuous surface. Some tile installations should be sealed for water and wear resistance. Because you’re probably wondering... If you’re within earshot of any Italians, they might appreciate you saying terrazzo with a hard Z sound, as in pizza. And you’ll get extra credit if you briefly tap down on the double R with a light D sound. Among Americans and other English speakers, you’ll draw fewer suspicious looks if you stick with the anglicized version, using soft Zs (as in nozzle) and the familiar, rounded R pronunciation that Europeans like to mimic by sounding like pirates (Arrrr!). Terrazzo floor tile is a tough, non-absorbent, low-maintenance material with plenty of design options for creating a one-of-a-kind floor. It’s a good choice for entryways, bathrooms, kitchens and other areas where floors are subject to lots of traffic and/or daily abuse, and some tiles are even suitable for outdoor use. For any wet or outdoor areas, be sure to discuss slip-resistance with your tile contractor or supplier: You don’t want a puddle of water turning the floor into a skating rink.